SNES version of the Mega Drive classic. 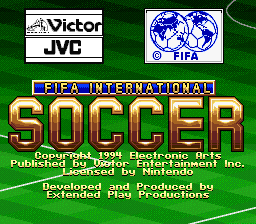 Now it's taken a while for this port over of the Mega Drive classic Fifa Soccer to reach the SFC, and that is where most of the problems lie! This IS basically the MD version, with no use of the SFC's superior hardware (even down to the grainy sound effects) but that isn't all TOO bad as the original was superb. The playability is intact, and the teams are updated to link nicely with the USA World Cup BUT and this is a BIG but, everything seems OLD, if this had been released earlier along with the MD version it would score very highly, but now it just feels basic and quite boring compared to Konami's AMAZING Perfect 11 Soccer. 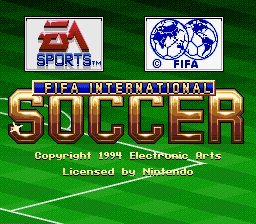 Still a solid if somewhat dated soccer sim, 5 player multi-tap version helps, but this is old tat compared to Konami's masterpiece.